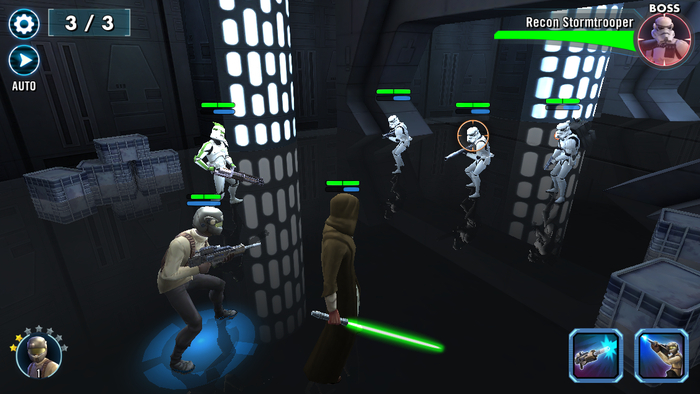 Below you’ll find lots of tips, tricks and cheats for the App Star Wars: Galaxy of Heroes for Android and iOS. Because this game is a Free2Play game, it makes sense to acquire some tips to progress as quickly and good as possible. This guide is for new players but also for advanced players, which can possibly learn something new. Also visit our farm guide and the best characters and teams guide for Star Wars: Galaxy of Heroes. These are the most important things to focus on in the game. This is how you will generate the most xp for your account level. You’ll also earn a lot of training droids and crystals through these. You’ll see me mention “dailies” throughout the guide, and this is what I’m talking about. Your list of dailies can be found by clicking the green “Daily Activities” button in the lower right corner of your main screen. It is imperative that you complete all of these every day if you want to keep up in the game. And it really doesn’t take very long to do it. It is recommended that you do the train a hero one first, as it gives you 20 sim tickets which can be used to instantly finish any battle you’ve achieved 3 stars on. You can complete this one by giving as little as a single tier one training droid to a non-max level character. Throughout your first week-ish of playing, you’ll come across the limited time offers that EA has put out for the game. There’s a Droid one, a Jedi one, an all-female one, and a TFA one. Each has a flat dollar-amount cost and is only available during the timeframe listed on the picture in the Data Card store. They will not come back around. They are one-time deals. Now, we don’t tell you this to pressure you into buying them. That’s entirely up to you. Use the search function to search for the heroes in them and decide for yourself if it’s worth it to you or not personally. We just letting you know that once their timers run out, they’re unavailable permanently (as the game stands now). A 3-star rating is required in order to use sim tickets to instantly complete the mission. A lower star rating does not affect the rewards gained from that mission. It will be the same if you 3* it as if you 1* it. If you lose your “ally” (your friend’s hero that you brought along), it will not count against your star rating for that battle. Star rating is meaningless for challenges and events. Another point for 3-starring a battle: if one of your party is defeated, but before the end of the encounter revived through any means (e.g Old Daka), the ‘victory!’ Screen will appear as 2 stars, but when you get back to that battle it’ll appear as 3 stars and will be simable. There is a lot of different factors that go into answering it, not the least of which is whether or not you’re a “spender.” There is a lot of consensus surrounding heroes like Luminara and Sidious, and it doesn’t seem to be misplaced, but there are a lot of things to consider. On that same topic, Luminara and Sidious are both highly sought-after for Arena play currently. They are extremely powerful in the current meta, and a staple in most team comps. Once you get to a certain Arena rank, 99% of the teams you face will have at least one of them. However, the general consensus is also that once you reach a certain threshold (some say top 50, some say top 10, some have other opinions), you will only see high-spenders in your bracket. This means people who have spent quite a lot on chromium packs to unlock premium heroes and promote them to 5, 6, 7*. For example, there was recently a video posted where a First Order Tie Pilot 1-shots a Vader in a rank 1 arena match (with various damage buffs, ofc). The general consensus surrounding that video is that he was at least a 6* FOTP. It is ridiculously difficult to get a FOTP to that star-level without spending exorbitant amounts of crystals on chromium packs, and it is almost certain that player did so. What that information means to you, is that unless you spend as much or more, you will not be able to compete with those best-of-the-best players. So, that means to a lot of people, it is more enjoyable/valuable as a player to invest in characters they find fun, or that fit their current team makeups, because honestly, you’re not going to crack the top 10-50 unless you spend as much or more irl $ as those other players. So for example, if you got a lucky pull from a Bronzium pack early on, it may affect who you farm from Cantinas, etc. Are you going to be screwed if you don’t farm Sidious from Arena rewards? Of course not. It’s just widely considered the best option because he’s such a strong hero in the current meta. But, hey, maybe you like Ventress as a character more, and you want to experiment with Nighsisters. Go for it. If you think that’s going to be more fun for you, by all means, do it. The bottom line is that this is a game, and it’s supposed to be fun. If you would have more fun playing the iconic characters that you love rather than the consensus best, get the ones you like! No one really knows anything right now. Most people’s teams are directed by access, so easily farmed characters who happen to be good are being very overhyped while there are plenty of undiscovered gems out there. You are probably just as well off building what you like (aiming for some basic synergies) than killing yourself for what is perceived to be the best today. Does anyone really know how good Luke / Han / Leia / Ackbar are yet? Very very few people probably have (for example) a Rebel team geared out to speak on it’s late game quality. Not to mention how many characters still need to be released (not just from TFA, also like Yoda or Clone Wars Obi-Wan) that could up-end the meta. Just pick what you like thematically and we’ll bet by the time you are 60 you’ll have something competitive. It’s really all about the current meta. Right now, it’s a healer-heavy meta, so that means a hero like Sid, with a 100% chance healing immunity debuff is extremely sought-after. But in games like this, the meta evolves as time goes on. New heroes are introduced, and balancing takes effect. Are there cheat codes in Star Wars: Galaxy of Heroes? 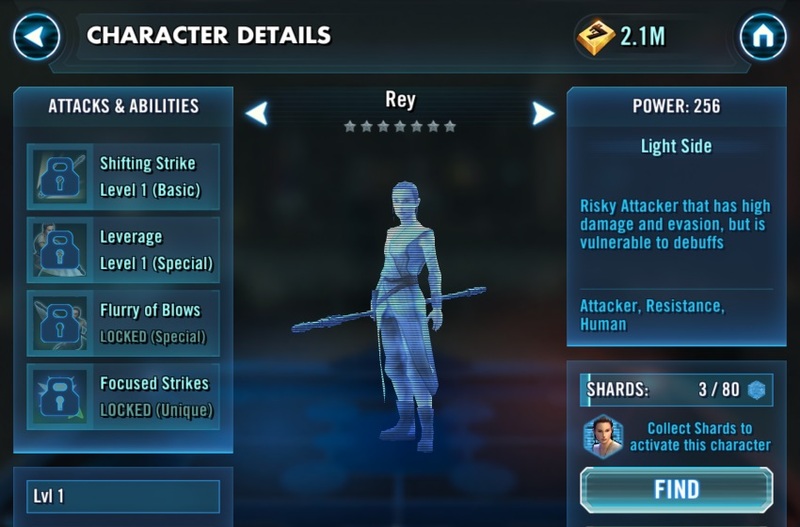 Let us now briefly talk about Star Wars: Galaxy of Heroes cheats. We are often asked whether there are cheat codes for the app. This does not exist, unfortunately, because Star Wars: Galaxy of Heroes is a Free2Play game, so you have to use real money to buy the premium currency. From time to time available on the Internet, are so-called hacks, with which one you should get unlimited premium items. These are not only illegal, but often hide viruses and Trojans that can do much damage to your phone or tablet. For this reason we do not recommend the use of so-called Star Wars: Galaxy of Heroes hacks or cheats. Also read our farm guide and the best characters and teams guide for Star Wars: Galaxy of Heroes. Do you know more tricks in this role-playing game, to progress more quickly? Then post your Star Wars: Galaxy of Heroes tips and tricks simply in the comments. We will then steadily expand this article. 7 Comments on "Star Wars: Galaxy of Heroes – New Player Guide with Cheats"
Gain as many allies as you can. You will be given x2 ally tokens for using ally’s heroes hence giving you more tokens for data cards. How can you remove a hero from your team & replace him or her with a different hero????!?? Ive been playing for 8 months. Im at level 83. It takes forever. Some shards hard to find.Who wants to spend $39.99 to get hardly any shards for 4 characters. I watch other players blast past me. They must be spending alot.